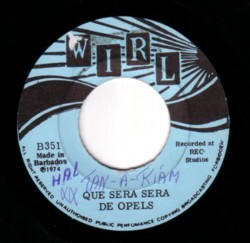 I just got two new 45’s on the Wirl label. Dirk Koorn bought them for me. I tried to find a site that has a discography of that records released on this label, but I couldn’t find it. I have about twenty-five good to great 45’s on the Wirl label, and I wouldn’t be surprised if they have made a few hundred. Or more! For most people the ska and reggae records are probably the most important records on the Wirl label, but I go for the slow soul tearjerkers. 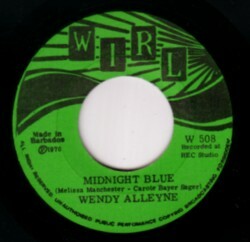 Like this one by Wendy Alleyne, ”Midnight blue” . The other 45 that Dirk gave me is one by The Opels. Here is their beautiful cover of the Doris day classic. The first part shows some SFX, because the vinyl has grown into a 3D object over the years. But when I keep my finger on the element of my record player and push the needle in the groove, there is nothing wrong with this record. If somebody happens to know more about the Wirl label, I would like to hear that.